Ever since I’ve been blogging about beauty I’ve heard such great stories about products from Japan. 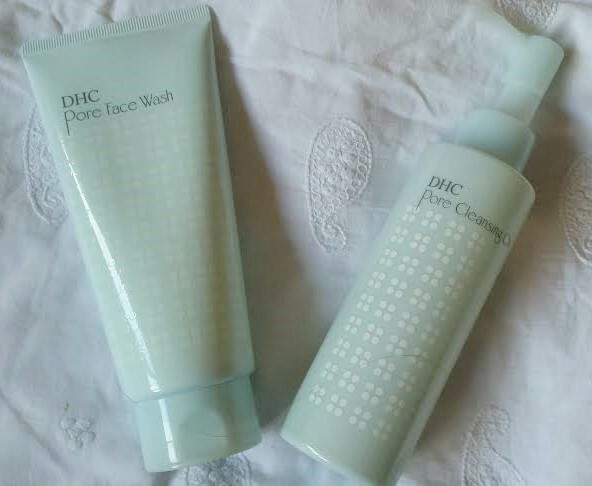 I’d never come across any of them on-line or in the shops and so when I got news of these two new cleansing products from DHC just dropping into my in-box recently I was really excited! So, it didn’t take me long to say that I’d like to try out these two new additions to the DHC Pore Series skin care collection. They are Pore Face Wash and Pore Cleansing Oil. Not heard about DHC UK either? They are a subsidiary of DHC Corporation, Japan’s No. 1 direct skin care company. The discerning taste of the Japanese and their stringent quality standards in skin care are reflected in DHC’s carefully formulated products. DHC beauty products are a result of extensive research and development, as well as tailoring and expanding the range to suit the particular preferences and needs of its customers. Plant extracts, especially Asian botanicals, are used extensively in DHC formulations for their nourishing properties and are balanced by cutting-edge scientific research to create only the best, most effective and safest products. I was a little nervous about using an oil on my face as I thought it might not work with my combination skin. So I decided to use it to remove my make-up at the end of the day and to follow it up with the Pore Face Wash. The oil is beautifully clear and pure and as I massaged it into my skin it felt so comforting. It lifted the make-up off really easily including mascara. I rinsed it off with warm water on a muslin cloth. It came off with no trouble and didn’t leave my skin feeling greasy. But just to be sure that there wasn’t any oil left on my skin I followed it with the Pore Face Wash.
“a foaming daily facial cleanser that helps reduce the look of enlarged pores by cleansing and refining. Active ingredients include two gentle exfoliants – baking soda and AHA from pear juice – to leave skin feeling smoother and looking brighter, whilst the addition of botanical humectants ensures that skin retains its natural moisture barrier and is not left feeling dry or tight. The gorgeous natural grapefruit fragrance makes this cleanser the perfect morning wake me up. This Pore Face Wash smells beautifully fruity and again I used it on a muslin cloth to gently rub it over all my whole face and then rinsed it off. My skin felt absolutely squeaky clean. I loved the feeling but did follow it up with my usual night-time moisturiser and eye cream to ensure that my skin got it’s night-time fix of moisture. In the morning I use the Pore Face Wash on it’s own to cleanse and then follow my usual daily skin-care and make-up routine. When I’ve looked closely at my skin I can see that the pores are clearer and my skin feels really clean and bright. I’ve read that there are more products in the Pore Series collection include Pore Milk, Pore Lotion and Pore Essence. Have you tried DHC or any other Japanese or maybe Korean brands. I’m so interested to hear more!